Neighborhood Watch is a community-based crime prevention program where neighbors look out for each other’s safety, property and homes in a systematic and sustained way. It is based on the idea that when residents, businesses, clergy, police and other partners look out for the safety of the neighborhood, establish and maintain open lines of communication, and collaborate to resolve problems of crime and disorder, they create safer, friendlier and healthier neighborhoods.You can learn more about the overall program or download the training manual on the MPD website. There will be a free neighborhood watch training session at the Trinidad Recreation Center on November 21st at 11 am. We encourage you to attend. This will be a good resource for the community and a way we can all help reduce crime of opportunity in our neighborhood. See the message from Neighborhood Watch Trainer below for additional information and where to register for the training. Neighborhood Watch Crime Prevention Training will be conducted at the following locations on the dates and times noted. They are free trainings open to anyone interested in reducing crime. Please let me know if you are coming though as hand-outs are prepared based on the number of participants, and space is limited. If you want to learn ways to prevent crime and reduce your likelihood of becoming a crime victim, please attend the training. You will see pictures of actual crime scenes and learn how to avoid becoming a victim of the crimes. 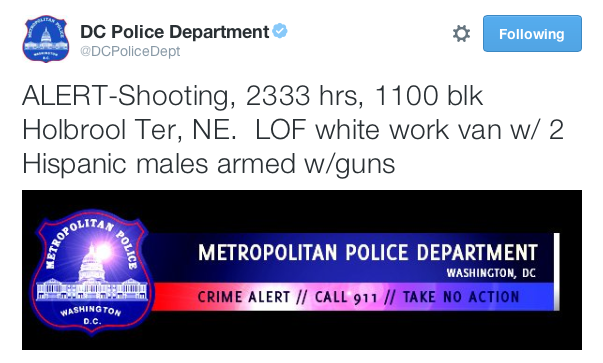 More than 80% of crime in DC is preventable (Crime of Opportunity). By reducing these crimes, the police can concentrate on preventing and solving more violent crimes. You will also learn how to become a block captain, and how to start Neighborhood Watch on your block. If you would like to attend the training, please contact me by email at NolanTutor@yahoo.com. I hope to see you at a training. Remember to email me if you would like to attend. What does the Office of the Attorney General do for DC residents? What is going on with crime in the neighborhood? Come to the next Trinidad Neighborhood Association meeting to get answers to those questions. ASL/English Interpretation will be provided by Access Interpreting, Inc.
“Alert: 5D is working a confirmed shooting at 1128 HOLBROOK TER NE DC. No additional information has been posted on that event and there was no victim identified in the shooting. Anyone with information should contact MPD. There was also a stabbing incident last night at Layla Lounge near Union Market on Morse Street. The press release from MPD on the homicide is below. (Washington, DC) – Detectives from the Metropolitan Police Department’s Homicide Branch are investigating a homicide that took place in the 500 block of Morse Street, Northeast, on Thursday, October 22, 2015, at approximately 1:10 am. Members of the Fifth District responded to the report of a stabbing. Upon arrival, they located an adult male within the block suffering from stab wounds, who was unconscious and unresponsive. DC Fire and Emergency Medical Services transported the victim to area hospital. The victim succumbed to his injuries and was pronounced dead. The decedent has been identified as 19-year-old Eric Jones of Clinton, Maryland. ANC 5D02 Commissioner Keisha Shropshire is holding the regular community meeting this weekend. The notice with information on the agenda and where to RSVP are below. ANC 5D02, 5D06, and 5D07 are the three Single Member Districts in Trinidad that are part of the overall ANC 5D, which has seven total SMDs. The borders for the 5D SMDs are in the map below so you can reference in which area you reside. HIPS DC provides the health outreach and intervention services to individuals and communities impacted by homelessness, sexual exchange and/or drug use. They will share information about their new center and resources offered, including an in-house health clinic, mental health and drug treatment services. October is Breast Cancer Awareness month. This presentation will highlight Ward 5 breast cancer statistics; the signs and symptoms of breast cancer; importance of early screening, detection and treatment; and available resources. Come hear the details of the newly proposed Pepco/Exelon settlement agreement and get your questions answered. Many of us contributed ideas to Gallaudet University’s (GU) design competition for the 6th Street NE development project. This feedback will be provided to the four finalists recently selected to continue with the second phase of the design competition. These four finalists will engage the project’s diverse community of stakeholders in a series of interactive workshops to be held at Gallaudet University the week of October 19 and will submit their final design proposals by January 2016. You can read more about the competition and the firms selected for the shortlist here. Recently GU also announced that they selected a new president to lead the university. Roberta Cordano will assume leadership of the university as Alan Hurwitz retires at the end of the year. We welcome her to the neighborhood and trust that the process to open gates between the university and the surrounding neighborhoods will continue under her guidance. 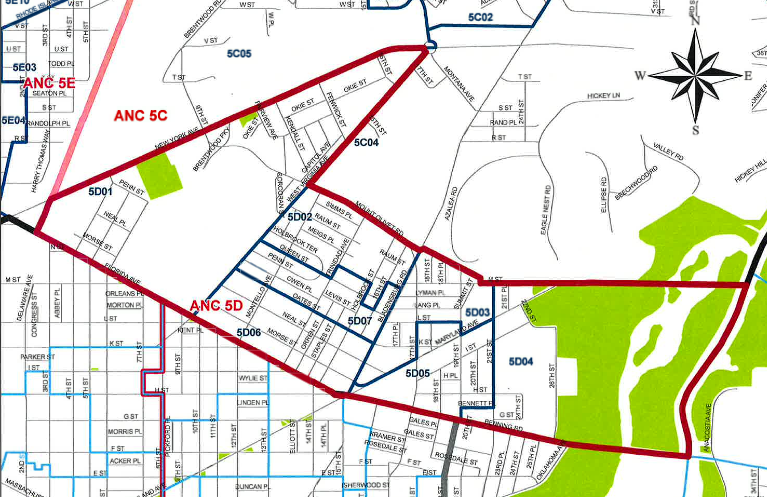 Did you miss the A5D Advisory Neighborhood Commission (ANC) meeting yesterday? You can catch up on local politics and watch it on YouTube. There are four videos with sections of the meeting. The agenda is posted below so you can identify specific segments that may be of interest to you. https://www.youtube.com/watch?v=7LM5xVzXa9Q Starts at the beginning of the agenda with call to order and roll call. https://www.youtube.com/watch?v=-usCeAFQxNM Continues with presentation in process by Thornton Development. https://www.youtube.com/watch?v=lDUlLHRxEHA Continues with presentation in process by Pepco on the merger with Exelon at the beginning of this section and concludes with brief discussion on minutes and treasurer’s report (which were not addressed or voted upon). https://www.youtube.com/watch?v=49FBhS5AExk This starts with discussion on the past due phone bills (over $2,000) and the meeting devolves into fighting and abrupt adjournment while the Council Member’s Office representative and Mayor’s Office representative try to convey information to the public. Citizen Concerns and Announcements were not addressed. 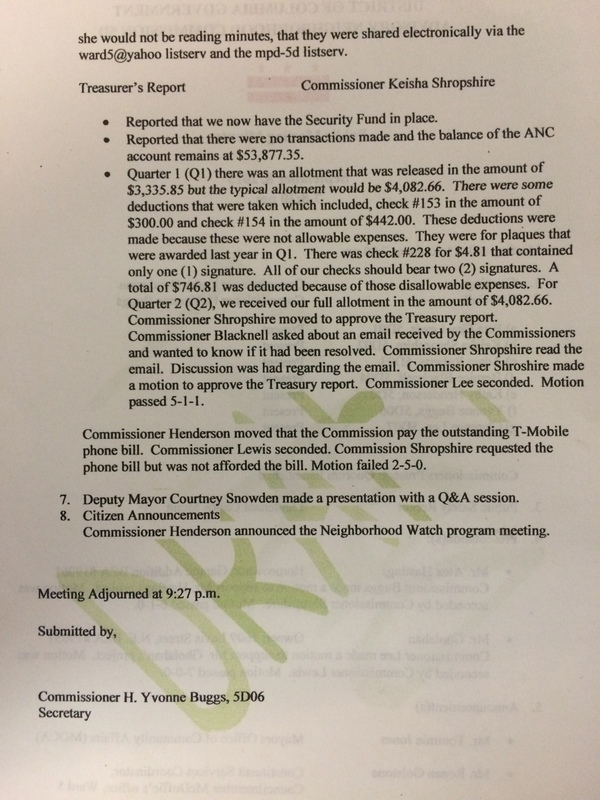 The outstanding issue of the Chair attempting to move funds from the bank account was not addressed at the meeting. That is unfortunate as the Office of the ANC representatives were present at the meeting to observe the process and procedures and could have addressed citizen questions on this topic. 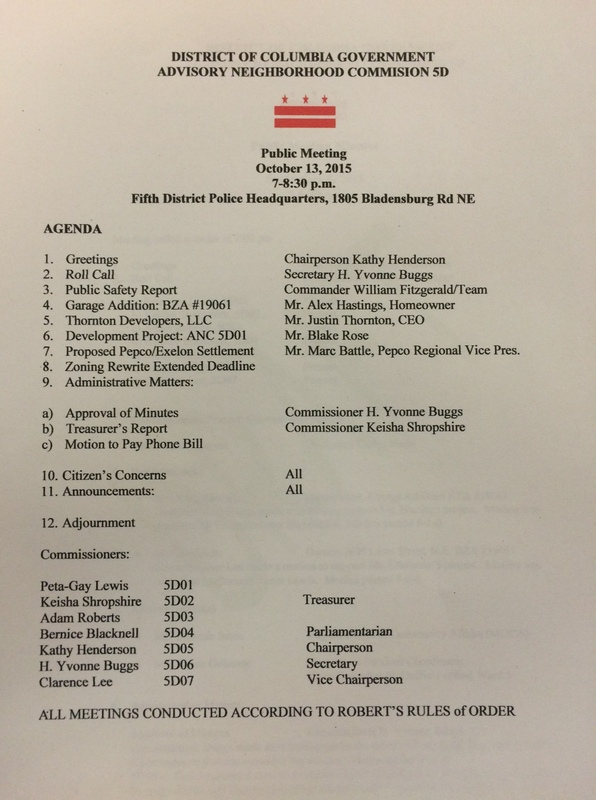 Agenda for the October 10th meeting and minutes from the September 2015 meeting. The following is shared from the Mayor’s Office of Community Relations and Services. Metro Washington Financial Planning Day (MWFPD) is a day-long education program where residents get free professional financial advice and education through one-on-one counseling and classroom-style presentations by highly qualified and licensed Certified Financial Planner™ professionals. The confidential one-on-one counseling covers a variety of financial subjects (e.g. credit and debt management, budgeting, savings, taxes, retirement planning, mortgages, small business resources, etc.). The MWFPD is organized by the D.C. Department of Insurance, Securities and Banking in collaboration with the Certified Financial Planner Board of Standards, Inc., Financial Planning Association, the Foundation for Financial Planning and AARP District of Columbia. 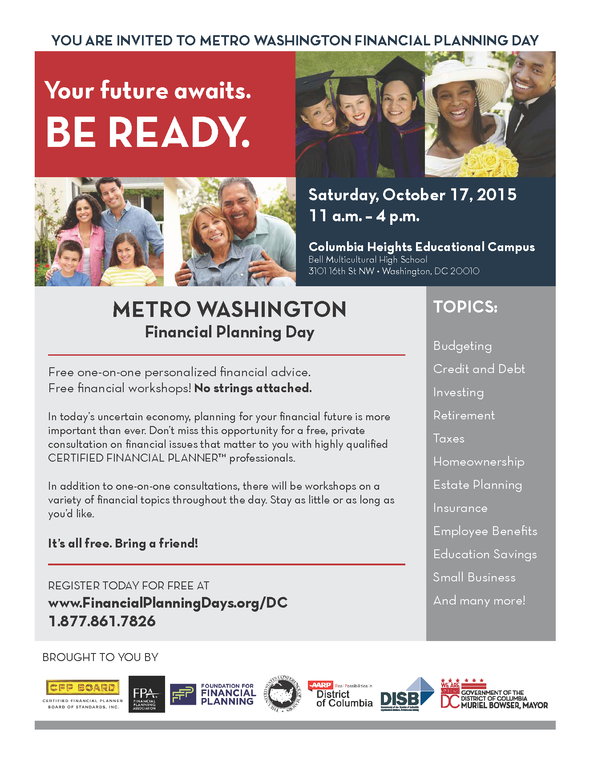 The Metro Washington Financial Planning Day is October 17 from 11 a.m. to 4 p.m. at the Columbia Educational Heights Campus, 3101 16th Street, NW, Washington, D.C. 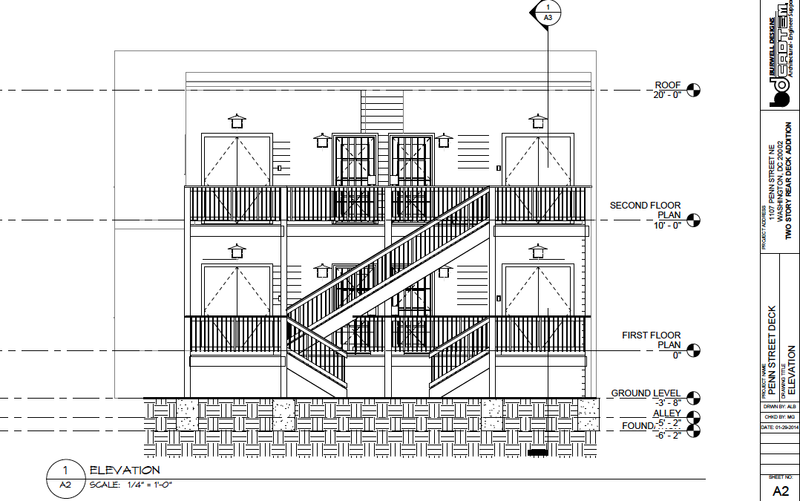 The building on the site covers 60% of the lot, which is the maximum allowed and the existing building already extends beyond the rear yard setback required. Justifications include compliance with code for interior sleeping units, safety in the alley from crime and inclement weather. The documents were not clear in whether this is special exception or a variance or both (both terms used in the same burden of proof document). Also this is a four-unit apartment building but there is reference to a single family residence in documents on-line. Additional information can be found on the BZA website for anyone interested in learning more about the request. The currently listed case number is temporary (BZATmp2). 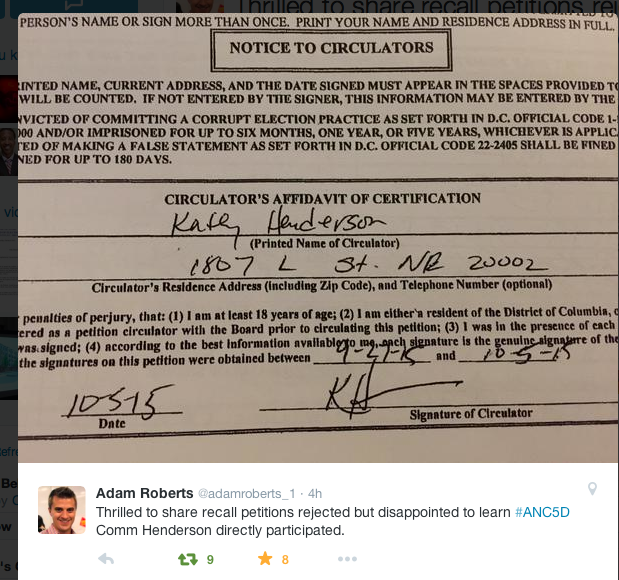 News has been coming fast on the ANC 5D recall efforts. 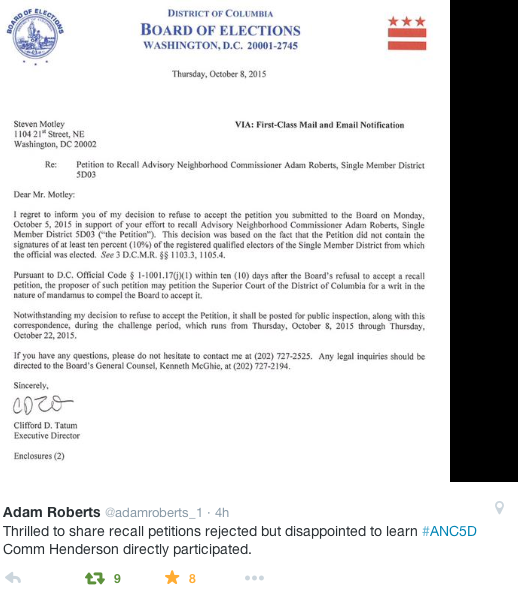 This morning ANC 5D03 Commissioner Adam Roberts provided an update on Twitter about the recall petition against him. The deadline to submit petitions was met but the DC Board of Elections determined that the required number of signatures was not met. His post is below.